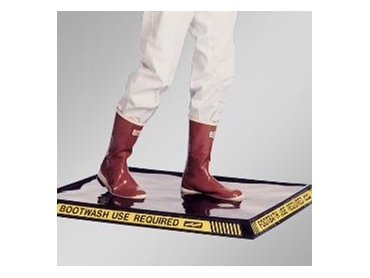 The Highwall Heavy Duty Rubber Bootwash, available from Saraya Australia , is suitable for use at entrances to all critical processing areas to stop contamination. The 50mm wall height ensures that the sanitising solution contacts sole, side and welt area of boots, thus penetrating into deep treads and eliminating both bacteria and soil. The Highwall Rubber Bootwash has a special designed double action for scrubbing the soles of boots clean. This is achieved by holding the soles out of accumulated sediment, while the solution sanitises them in one process. It is a step off clean and sanitiser of boots. The Highwall Rubber Bootwash comes in two sizes. The large mat (812x990mm) will cover most doorways and ensures that personnel will not bypass the footbath. The large Bootwash holds 20 litres of solution and the standard 22mm Rubber Bootwash (812x610mm) holds 4 litres of solution.